Home » News » Why Is The CDC Lying About E-Cigarettes? For years anti-smoking activists and public health officials have tried to justify their irrational hatred of electronic cigarettes by arguing that vaping leads to smoking, especially among impressionable young people who otherwise would never touch tobacco. But that is not happening. 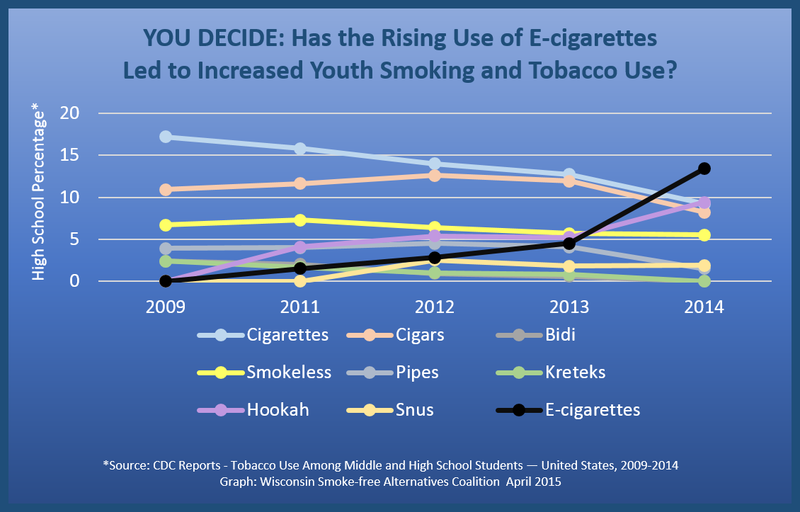 To the contrary, vaping and smoking rates among teenagers are moving in opposite directions. Rather than admit they were wrong to claim that e-cigarettes are a “gateway” to the conventional kind, opponents of vaping have escalated their prevarications by implying, in defiance of all scientific evidence, that there is no important difference between the two kinds of nicotine delivery devices. According to the latest numbers from the National Youth Tobacco Survey, which the U.S. Centers for Disease Control and Prevention (CDC) released last week, 13.4 percent of high school students reported past-month use of e-cigarettes in 2014, up from 4.5 percent in 2013. During the same period, the rate of past-month e-cigarette use among middle school students rose from 1.1 percent to 3.9 percent. “E-Cigarette Use Triples Among Middle and High School Students in Just One Year,” said the headline over the CDC’s press release, which spawned myriad news reports highlighting that point. The divergence between vaping and smoking is even more dramatic when you look at the period from 2011 through 2014, when the rate of past-month e-cigarette use rose from 1.5 percent to 13.4 percent among high school students and from 0.6 percent to 3.9 percent among middle school students. Meanwhile, past-month cigarette smoking fell from 15.8 percent to 9.2 percent in the older group and from 4.3 percent to 2.5 percent in the younger group. Needless to say, this is not what you would expect to see if vaping encouraged smoking. If anything, these data suggest that e-cigarettes are replacing the real thing. As one tobacco researcher told The New York Times, “They’re not a gateway in, and they might be accelerating the gateway out.” That cannot be anything but good news from a public health perspective, given the huge difference in risk between vaping and smoking. By kristinnollmarsh in News on April 24, 2015 .